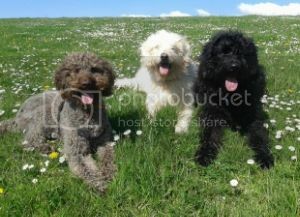 UK Labradoodle Association • View topic - Coconut oil? Has anyone used coconut oil to clean teeth? I have to admit I've been fairly lax with the Dude tooth cleaning,but I'm not impressed with the ingredients used in these "meat flavoured" dog toothpastes! An elderly lady with a v snappy Maltese Terrier mentioned using coconut oil as tooth paste. What do you all use to clean your doodles teeth? Post subject: Re: Coconut oil? Never knew about this Anny but I googled it and you can indeed use coconut oil.There are also other natural products available. I just use a salt solution on my dogs . I use an enzyme based toothpaste - they seem to need the brushing and the enzymes carry on working afterwards.